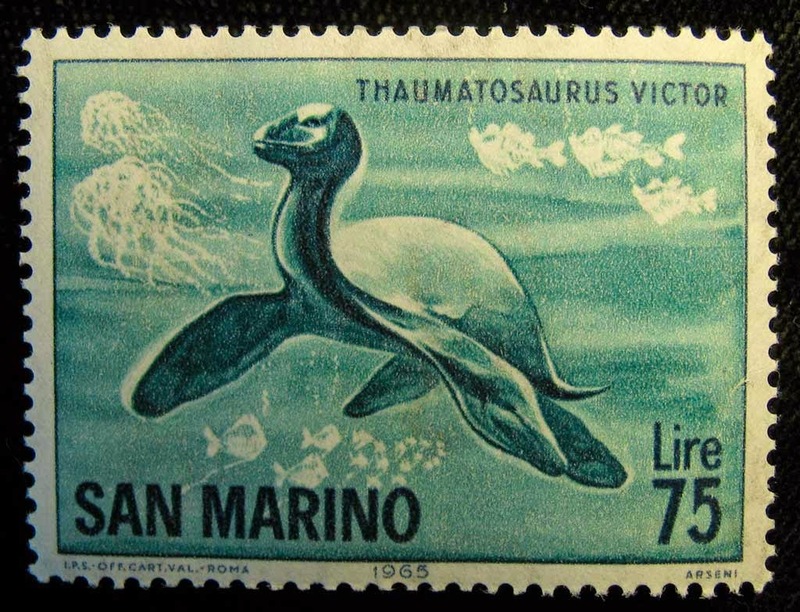 Here is a picture of the Thaumatosaurus victor marine reptile stamp. It was issued in 1965 by the small republic of San Marino (located on the Italian peninsula). The stamp was part of collection of nine issued that year. The Thaumatosaurus victor was named in 1841 by the German palaeontologist Hermann von Meyer. His specimen was found in the Posidonia Shale of Holzmaden, Germany. The genus Thaumatosaurus ("wonder reptile") has been renamed Meyerasaurus in honor of Hermann von Meyer. The creature existed in the early Jurassic Period (183-180 mya).